To get register for the HALO test drive demonstration, please enter in your details below. Discover the powerful features within this investment research platform. To get register for the HALO test drive demonstration, please enter in your details below. First come first serve! Analyse ASX-listed companies like a professional using a variety of indicators. Identify trends and opportunities in the market using a combination of Fundamental and Technical Analysis. Create blends and scans giving you an insight into when to Buy, Accumulate and Sell. Monitor your portfolio to keep track of your performance, expected dividends and style. Self-directed DIY Investors who are looking to analyse companies as well as their porfolio with all the critical metrics they need. Share Advisers, Stock Brokers and Traders who are looking to research and identify long-term stable investment strategies or short-term model driven strategies. Mum & Dad Investors who are looking to take direct control of your investment portfolio and effectively understand how to read the market. Fund Managers and Financial Planners who are looking deliver increased performance for their clients. What you can expect from the HALO Investment Platform. HALO is your complete investment solution, whether beginner, intermediate or expert. Our research solution provides investors with a wide array of tools and resources to make more informed and confident share market decisions. 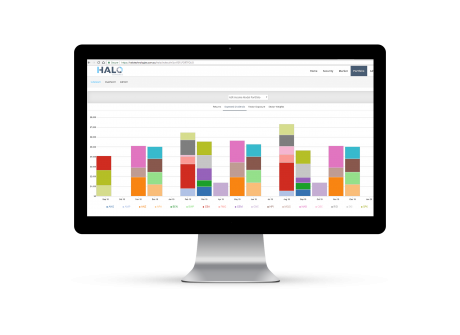 HALO allows clients to upload and enter in their existing holdings to gauge and compare how their portfolio measures up against the ASX and a myriad of other benchmarks. Our pre-built scans are used by professional fund managers to quickly identify investing and trading opportunities, in particular, growth or income yielding stocks. Keep up to date with the latest company news, announcements and events on the Australian Stock Market. Long-Term, Short-Term, All-Weather, DIY, Adviser, Fund Manager, Financial Planner or Treasury Manager. HALO can help. HALO combine various components of price and expectation formation to take the guess work out of what to Buy, Accumulate and Sell - the heart of investment decision making. HALO brings unparralleled productivity with 1-click functionality at the heart of the system. 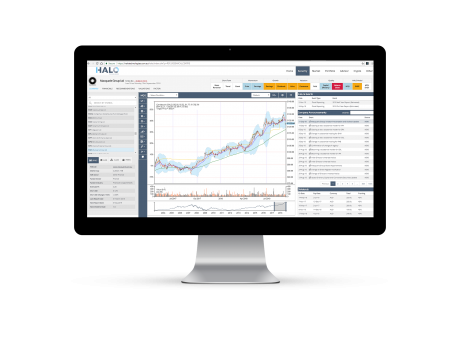 Take control of your investment portfolio with HALO's advanced portfolio management dashboard.